Kairavini karaiyinile - திரு அல்லிக்கேணி குளக்கரையோரம்: Geethacharyan issue no. 482 features my article !! Happy !!! Geethacharyan issue no. 482 features my article !! Happy !!! 482 ~ the number is magical to me !! Section 482 in The Code Of Criminal Procedure, 1973 : reads : Saving of inherent powers of High Court. Nothing in this Code shall be deemed to limit or affect the inherent powers of the High Court to make such orders as may be necessary to give effect to any order under this Code, or to prevent abuse of the process of any Court or otherwise to secure the ends of justice. To me this magical no. 482 ‘denoting the no. of issues’ of divine magazine Geethacharyan is all significant – making me feel very happy. 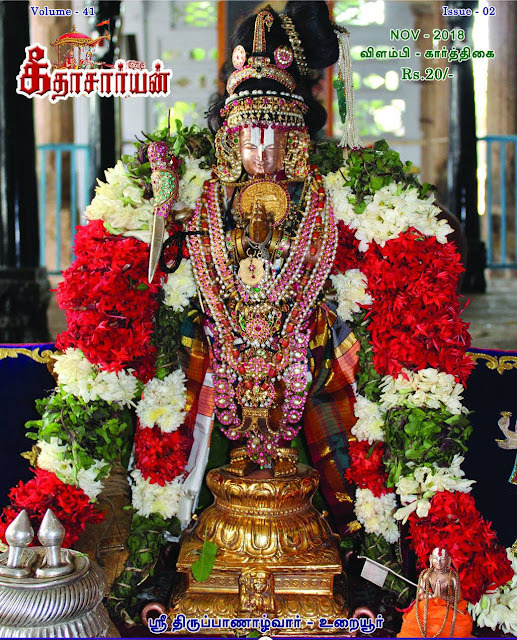 You are looking at cover page of Nov 2018 issue of Geethacharyan that has Sri Thiruppanazhwar at Uraiyur avatharasthalam. Geethacharyan is a prominent sampradhaya magazine [Sri Vaishnava Sampradhaya book] started in the year 1978 and continuing in its own way for more than four decades now. It is one of the oldest magazines of its genre; this issue is issue no. 482 Dr M.A. 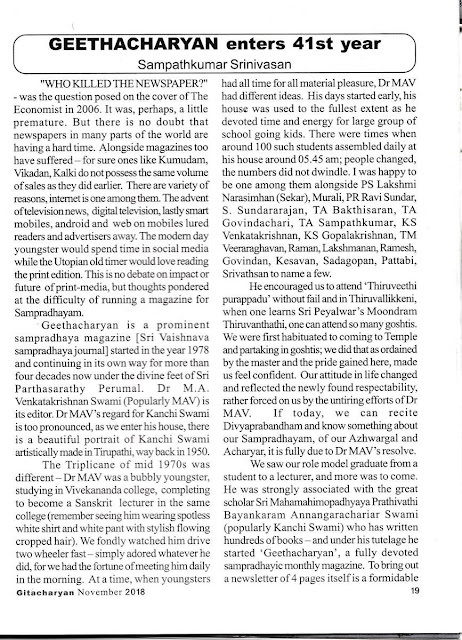 Venkatakrishnan Swami (Popularly MAV) is its editor. 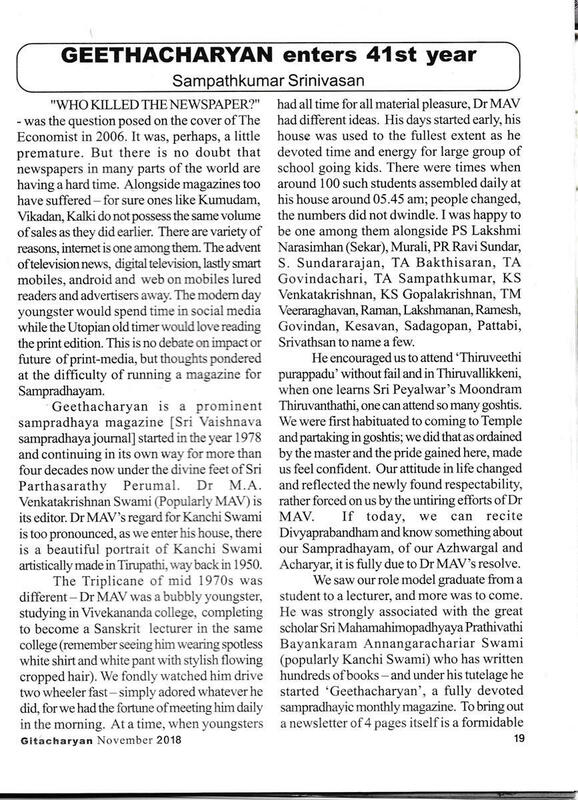 MAV is a tremendous personality - in the lineage of Mandayam Ananthanpillai family, a descendant of Anandalwan, a disciple of Sri Ramanuja. 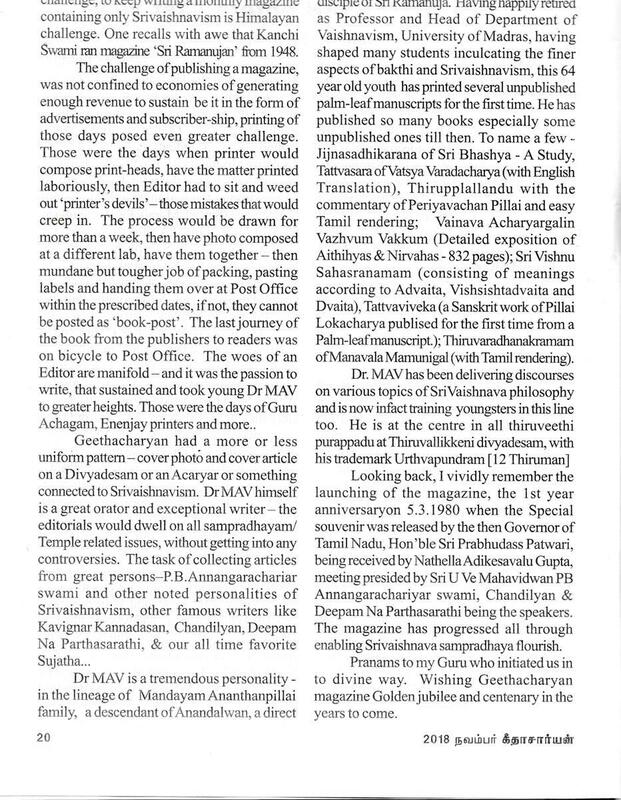 Having happily retired as Professor and Head of Department of Vaishnavism, University of Madras, having shaped many students inculcating the finer aspects of bakthi and Srivaishnavism, this 64 year old youth has printed several unpublished palm-leaf manuscripts for the first time. Pranams to my Guru who initiated us in to divine way. 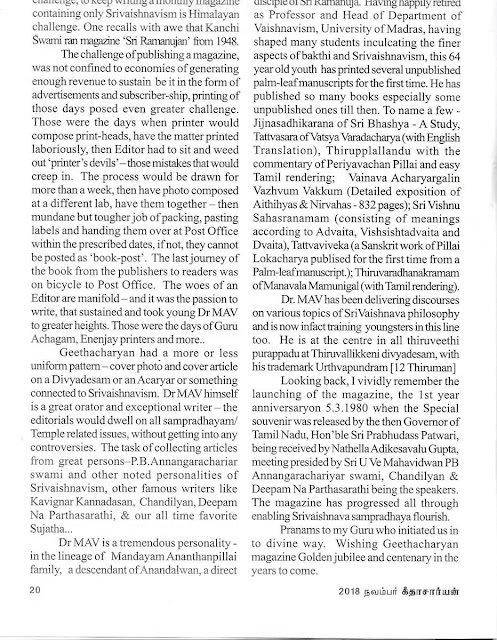 Wishing Geethacharyan magazine Golden jubilee and centenary .. ..
~ am feeling doubly elated as my article on Geethacharyan entering its 41st year finds a place in the exalted magazine.